Finally, we should ask why, seventeen years after the Dayton Accords, the international diplomatic community continues to tolerate ultra-nationalist rhetoric, hate speech and genocide denial in Republika Sprska? It seems that the way we live should be at least as important as the way we vote. A moratorium should be declared on campaign or political posters that inflict psychological harm on the survivors. Moreover, the psychological harm caused by the posters, statues and ultranationalist gatherings should be seen as a form of persecution, that is to say, as a crime against humanity that should be prosecuted. The European Union apparently wants Bosnia to solve its own problems and develop its own political culture, free of imposition from the international community. However, the intimidation caused by the hate speech, as well as by secessionist and ultranationalist rhetoric, prevents refugees from returning to their former homes. If such divisive and hurtful rhetoric will not be addressed effectively, it is not reasonable to expect refugees to return, at least at the present time, and certainly not reasonable to blame them for not returning. In that case, a so-called democratic election, conducted in the absence of the refugees and on the graves of the victims, would be little more than a sham. On July 11, 2012, I helped bury three brothers from the village of Poznanovići, ages 21, 23, and 25, in the Potočari Memorial Cemetery. Those young men might well have voted this year, but for being murdered during the genocide in 1995. To allow elections to proceed under such conditions in the name of democracy, without addressing hate speech in all of its forms, and without allowing all refugees to vote unimpeded, strikes me as no less than rewarding the perpetrators for a successful genocide, which should be absolutely unacceptable in a society operating under the rule of law and with respect for human rights. I was indeed concerned, for example, by the campaign slogan of the political party, “Alliance of Independent Social Democrats” (SNSD), the party of Milorad Dodik, the President of Republika Srpska. 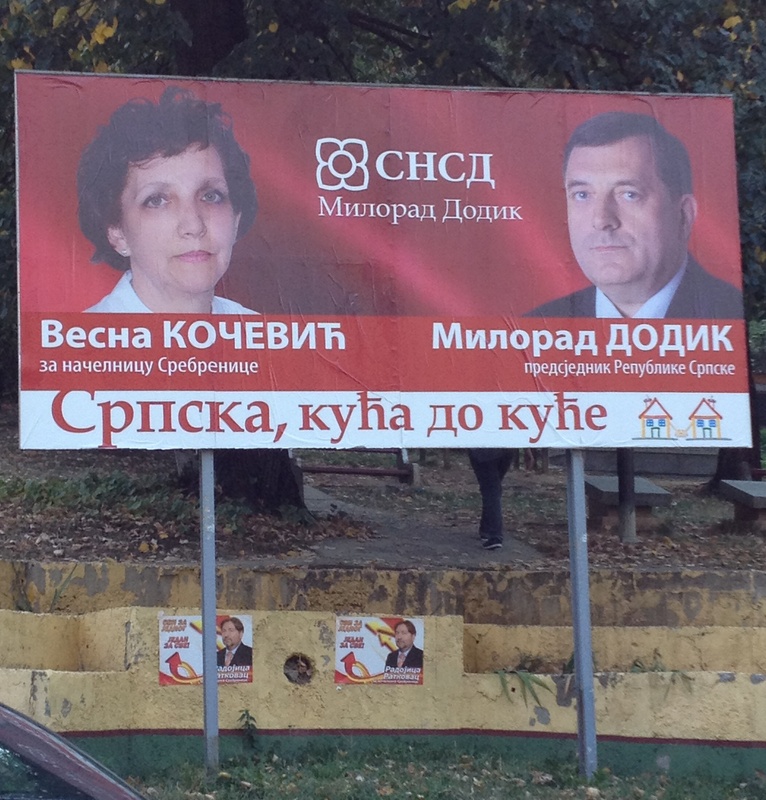 The slogan, which could be seen on posters all over Srebrenica, was "Српска кућа до куће" (“Srpska, kuća do kuće”), meaning "Serb, from house to house." (We are probably also meant to "hear" the word "Srpska" as "Republika Srpska.") At any rate, the unfortunate implication is that the political ideology of the SNSD and its candidates entails an ethnically homogeneous Republika Srpska, leaving no room for any non-Serbs. Given the historical context of the genocide that led to the founding and legitimization of Republika Srpska, the political slogan, "Serb from house to house," can be interpreted as a continuation of the intention to exclude non-Serbs from Republika Srpska through such means of persecution and psychological intimidation. Serb Radical Party of Vojislav Šešelj on the local ballot. An additional concern was that the “Serb Radical Party of Vojislav Šešelj” was on the local ballot. In other words, one could vote for the Serb Radical Party of Vojislav Šešelj as well as for members of the party for the local municipal council. The presence of Šešelj’s party on the ballot seemed to sanction the atrocities committed in his name, or in the name of his ultranationalist and exclusionary policies as part of the aggression that took place from 1992-1995, when he was a vigorous proponent of uniting “‘all Serbian lands’ in a homogeneous Serbian state.” It is probably not sufficient to simply state, by way of explanation, that Šešelj is on trial for war crimes from Croatia to Bosnia and Herzegovina. It is more accurate to say that his name has become synonymous with those very war crimes, as well as with the continuation of a political culture of intimidation and exclusion directed against non-Serbs throughout Republika Srpska. In fact, Šešelj has only recently been convicted for a second time of “Contempt of the Tribunal,” this time “for disclosing confidential information pertaining to protected witnesses.”Hence, I found the presence of his party and of his name on the local ballot highly problematic.